Every morning, the fine folks at Sports Radio Interviews sift through the a.m. drive-time chatter to bring you the best interviews with coaches, players, and personalities across the sports landscape. Today: Maybe some hyperbole from the Nats manager, but not much. 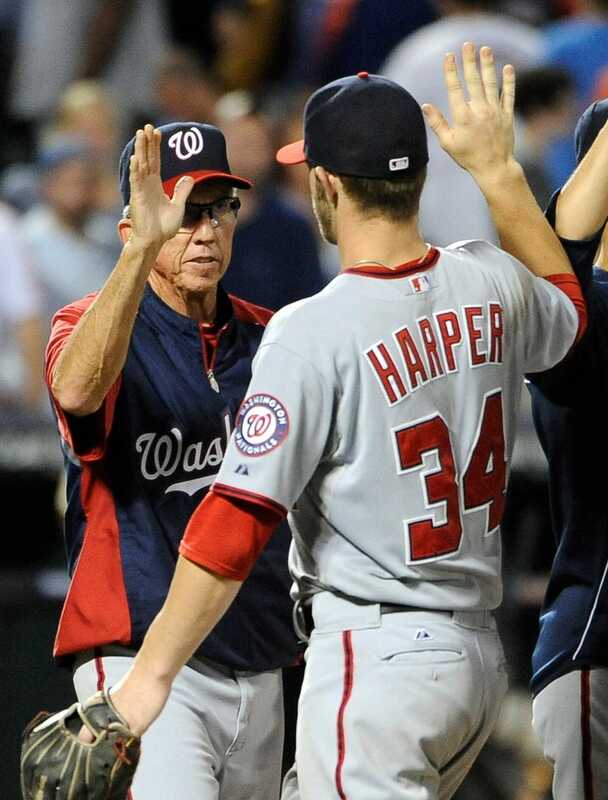 Davey Johnson joined 106.7 the Fan with the Sports Junkies to talk about whether he is surprised that the Nationals are this good, whether he has ever had a player as good as Bryce Harper as young as Harper is, if he is concerned at all about pitchers like Edwin Jackson and Jordan Zimmerman, why he had a meeting with his players the other day and whether he is going to start adjusting his pitching rotation in preparation for the playoffs. "I knew the talent was there. I'm not blind. I may be old but I can see talent. All we had to do was play up to our ability and if we did that then I thought we could win our division. It's come a lot quicker. I mean guys have been able to start doing the things they are capable of doing quicker and some young guys really, from the minor leagues, didn't have an opportunity to see a whole lot and of course Harper coming up, the young studs have really held us in there because we have had big injuries and they have been the guys that have been the mainstays." "He's an unbelievable talent. I've had some unbelievable talent. I've had (Daryl) Strawberry, I had a 17-year-old named Dwight Gooden and saw him throwing about 95 and painting with it. But he's a gamer and Bryce might be my favorite player of all-time because he plays the game as hard as anybody can play it and he never lets up. He's wonderful to watch." "Good question. None at all. These guys are quality pitchers and you can run through tough spots sometimes in this time of year. You know you kind of get a little hyped up and try to do too much and as far as the innings stuff, these guys can do 300 innings this year if need be, they're fine." "First of all I'm a pretty good manager and I know that but let me tell you something, I had that meeting and you know why I had that meeting? Because I had it for you guys so you guys would think I was doing something. (Host: So what did you say to them? Anything?) I said nothing. I told them ‘hey guys we're fine." "I think whoever plays the wild card because they're going to have to throw their best pitcher to win that game so you're going to get the next best guy so I think that's a great advantage. You need the best record and that's what lines you up for that." "Great question. I kind of like to leave them the way they are. Once you clinch, once we clinch then you can realign guys and maybe give a guy an extra day here and there but line them up when you know who you are going to play and put your best foot forward. They're kind of lined up the way I would do it anyway. There's not really a whole lot to do there. As far as how I get these guys motivated, guys we're in a pennant race. These guys come to the ballpark and they're flying high. They can't wait. The energy is there trust me. I don't have to do a Knute Rockne on these guys. They're pumped. Believe it." "Citi Field is like a morgue. I remember when I was here we had 50,000 packed in Shea. I love our ballpark man. The fans have been outstanding. They're into it. It's great and I've seen a big change since I've been there and I know how it was when I was with the Orioles coming in and whooping the Senators. I really like the fans and I love the ballpark. The fans have been coming out. I know there are still a lot of Redskins fans here but we're getting a lot of great fans, we love it." • Jason Witten really shouldn't have googled "spleen injuries." • Jeremy Maclin has some issues with the replacement refs. • Jon Jones doesn't regret begging off a fight with Chael Sonnen.